If you’re like most women, you love to shop. We have so many options, however, making smart buying decisions when it comes to handbags is not as easy as it once was. There is not just one It Bag or style that’s en vogue. And not everyone can afford dozens of bags in all shapes and sizes, so it’s important to choose wisely. The good news about having so many options is that there are a variety of styles and price points, so you can find the one that works best for you. Before buying any handbag, think about your wardrobe and lifestyle. Are you more sophisticated with a polished look? Do you have a corporate job and attend a lot of work events and travel for work? Or, do you have more a casual work environment, like a yoga studio or spa? Your handbag should reflect the way you dress and fit your lifestyle as well. If you hit the clubs on a regular basis you will probably have different needs than a mother of three (then again, maybe not!). Spring is finally here and summer is within sight. And warmer weather means more wardrobe options and summer vacations. A silk scarf is a must-have accessory for spring and summer (especially for the beach to keep fly-aways at bay). Scarves make for a great travel accessory too. They're lightweight and don't take up much room in handbags or luggage, and you can use them to create different looks from the same outfit. While we haven’t seen piles of snow yet, the temps have dropped in many parts of the country. Even temperate climes get a little chilly at night--yes, even in California. Once the snowbanks bog us down, we often go from battling brute force winds to sweltering indoor heat. The best way to deal is by layering and choosing your accessories wisely. Colorful scarves liven up fall wardrobes. 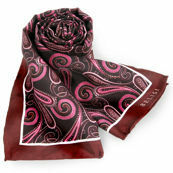 The Rosebud Luxe Paisley scarf by Belisi blends warm burgundy tones with delicate pink in a paisley patten. Tie it around a ponytail or wear as a headband. Nothing rhymes with orange, originally uploaded by peterbelisi. Orange is underrepresented in many wardrobes. Camilla and Daniel show how to use orange for an exciting look. The necktie and scarf have the Belisi 'hurricane' print. Camilla's bag is from the Belisi signature canvas line. The mandarin bag is trimmed with gold accents.